Catering Design Group (CDG), the award-winning restaurant and commercial kitchen design company for the hospitality industry, has completed a dramatic transformation to the first floor restaurant space at the Barbican Centre in London – Europe’s largest multi-arts and conference venue within a grade II listed building. Having worked closely together on past projects including Kenwood House and world heritage site, Blenheim Palace, CDG were again commissioned by Searcys to bring their concept to life. Re-branded ‘Bonfire,’ the casual dining venue provides an informal restaurant and bar space, where customers can enjoy great food without the need to pre-book. The philosophy behind ‘Bonfire’ is simple: ‘Bring to the Barbican a bar and restaurant that serves up high quality food in a relaxed and comfortable environment’. Building on this philosophy and the wider operational brief, CDG designed and completely renovated the 300 square metre space (formerly the ‘Barbican Lounge’ restaurant) together with a refurbishment of the kitchen to include state-of-the-art equipment around a theatre style space to complement the ‘laid back’ environment front-of-house. 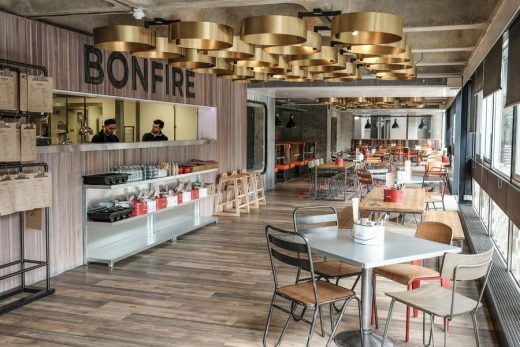 An urban setting was created to showcase the personality of the ‘Bonfire’ brand and its menu of rotisserie chicken, burgers, milkshakes and ‘comforting’ desserts. A dramatic feature wall backlit with LED lighting was designed to display the ‘Bonfire’ signage, giving customers the illusion of a sunken bonfire and branded livestock. Taking inspiration from the celebrated architecture and exposed concrete prominent in the original structure, CDG immersed themselves in the raw, industrial nature of the space, enhancing it further with the use of reclaimed timbers, galvanised steel, corrugated metal sheets and steel mesh panels. Menus are held by steel components and clipboards suspended from butchers’ hooks. The rich, vibrant reds, blues and orange bonfire tones add warmth and interest around the space. 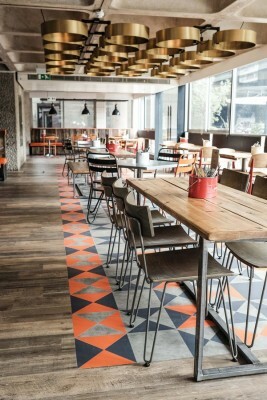 Statement patchwork floor tiles in navy, orange and grey, cleverly zone the space, whilst subconsciously leading customers effortlessly through each area to improve customer flow. Furniture within the bar and across the banquette dining area features reclaimed timber and galvanised steel finishes. Oversized, industrial copper pendants provide an eye-catching feature over the bar, complementing the tones of the floor tiles underneath.